The author's model of Babbage's Difference Engine #2 from standard Meccano parts. 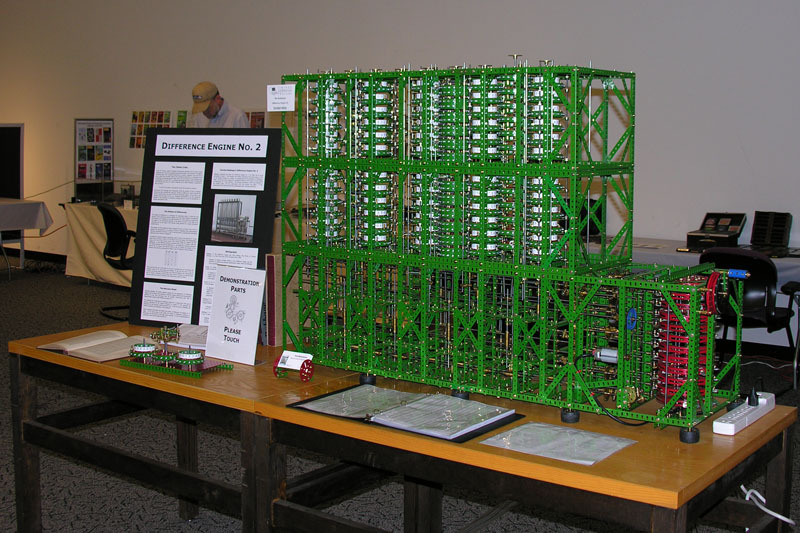 This model was exhibited while it still a work in progress, at the 2005 Vintage Computer Festival hosted at the Computer History Museum in Mountain View, California. The pictures below are from that event. It was awarded 2nd place in the class "Re-creation, Emulation, or Contemporary Enhancement", the special award "Best technology, Non-electronic", and by popular vote of the attending public, received the "People's Choice Award". Only two orders of differences were operational, so it was demonstrated calculating a simple table of squares. 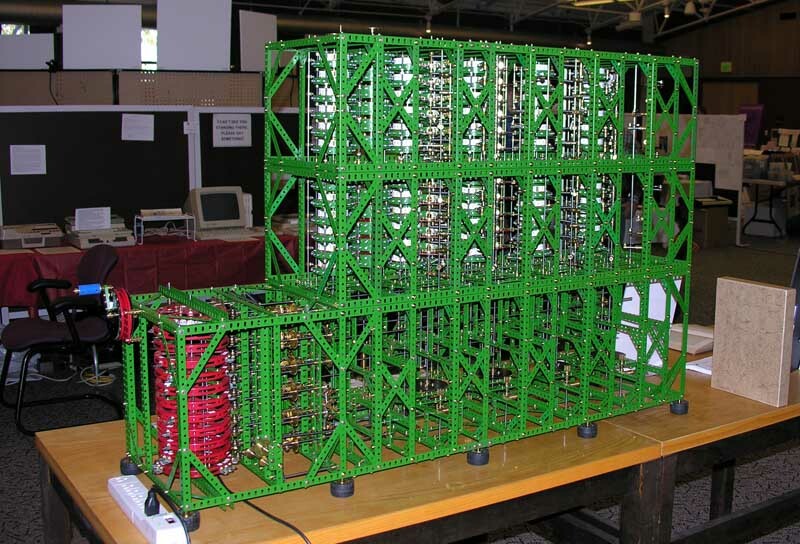 The completed machine was exhibited at the Maker Faire, April 22-23, 2006 in San Mateo, California, where it attracted constant attention. This model follows fairly closely Babbage's original design from 1848, though the constraints of using only standard Meccano parts inevitably mean some aspects of the operation are somewhat different. The model can handle decimal numbers with up to twelve digits, and up to four orders of differences. Babbage's original design called for 31 digit numbers and seven orders of differences. It was not actually constructed until 1991 when the Science Museum in London built it to mark the bi-centenary of Babbage's birth. Unlike Difference Engine #1, in this design Babbage made a clear distinction between control and data. This results in a dramatic simplification of the per digit mechanism compared to the first difference engine. Scaling the machine to larger numbers simply involves extending the columns vertically. Adding more orders of differences extends the machine horizontally, but neither entails any significant change to the control. The model calculates reliably, producing a result about every 7 seconds - somewhat faster than they can be read off and written down - and about the same as the "original" at the Science Museum. I have no doubt that if the Meccano of the 1920's had existed 100 years earlier, Babbage would have been entirely successful in his quest. It may be amusing one day to attach a Meccano steam engine to drive the mechanism and therefore realize "computing by steam". The picture below shows the view from the rear with the control section at the left. The calculating part follows very closely Babbage's original drawings. The control section however does deviate somewhat from the prototype. Babbage was able to make cams of arbitrary profile to control the rods and levers that distribute the motions through the machine. Meccano does not offer the possibility of arbitrary cam profiles, nor is it strong enough the handle the large forces that would be involved. Instead, the model uses a stack of built up cams to control a bank of intermittent motion mechanisms which transfer power directly from the source to the actuating levers. If you have a very fast connection and a fast CPU, a short high resolution video can be downloaded here (240MB, MPEG2).